The collection Prosperity through Freedom (now available in ebook) appeared as the postwar liberty movement in America was beginning to mature. FEE had been founded in 1946, and had accomplished amazing things in a decade and a half. It took a brilliant idea and turned it into a real cultural force. Its principles all revolved around the practical and moral case for the free society. In this snapshot in time, you find the principles stated and reapplied on many issues. Fertig was a man of quiet dignity who had enormous influence behind the scenes. 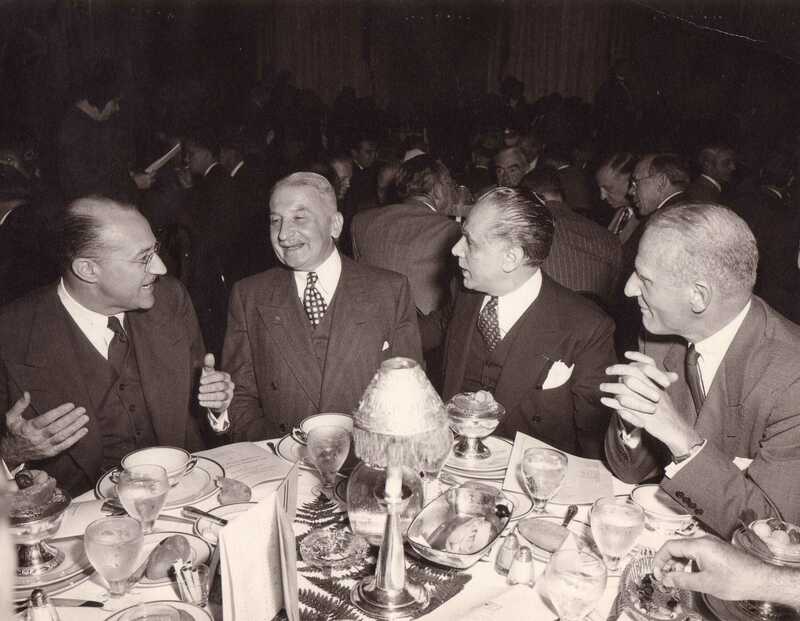 And there is a special story to the life of the author: Lawrence Fertig (1898–1986, pictured above on the right). He was an alumnus of New York University and Columbia University, with two degrees in economics. He chose advertising as a career, so he was one of the original Mad Men executives (think Roger Sterling, but with sterling character). It was a burgeoning industry that readily accepted the demands of the market system and championed it at a time when Keynesianism, socialism, and worse were being taught in the universities. He became an advocate for free enterprise at a time when it was under attack from all sides. Fertig was a man of quiet dignity who had enormous influence behind the scenes. He was the reason that Ludwig von Mises got a job at New York University. Fertig used his connections as a member of the board of trustees, as well as paying the bulk of the funding, to make sure Mises had a professorship there. In doing so, he worked closely with Henry Hazlitt, who was then a top editorialist at the New York Times. He then became involved with the Foundation for Economic Education, and stayed involved to provide invaluable guidance until his death. Liberty was his cause, his passion, and the object of his financial support. People underappreciate the contribution of people like Fertig. Ideas don’t move into the mainstream on their own. Good ideas need generous benefactors. They need to be pushed. They need to be marketed. There is some poetic beauty that an advertising executive from the age of Mad Men was the one who gave liberty the kick it needed. Liberty was his cause, his passion, and the object of his financial support. He left a huge legacy. This book, long out of print, is only part of it. The rest of his legacy can be found in the massive, global, and enormous influence of the ideas he loved so much.